This card's effect temporally relates to the past, sending monsters back to a player's hand and sending itself back to the Deck. This card appears to be named after Metatron, a prominent angel in Jewish mysticism. The effect of this card to return monsters and inflict damage for each one is a downgraded version of the anime effect of Kamion, the Timelord. This card is the first Timelord monster to be released in the OCG/TCG. This monster can be Special Summoned from anywhere else except the Deck. Also, if it's sent from the Deck to the Graveyard, you can Special Summon it from the Graveyard. "Cannot be Special Summoned from the Deck" is not treated as an effect of an Effect Monster. The effect that returns monsters to the hand is activated at the end of the Battle Phase, regardless of whose Battle Phase it is. A "Metaion, the Timelord" sent from the Deck to the Graveyard can be Special Summoned by the effect of "Monster Reborn" or similar cards. : "Metaion, the Timelord" says that it cannot be Special Summoned from the Deck, but could it be sent from the Deck to the Graveyard by "Foolish Burial", and then be Special Summoned to the field by the effect of "Monster Reborn" or similar cards? 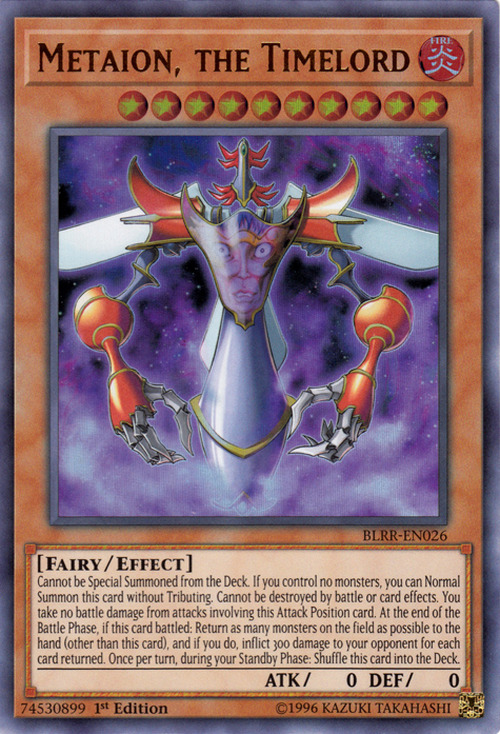 "Metaion, the Timelord" effect that returns all other monsters to the owner's hand, and then inflicts 300 points of damage to the opponent for each monster returned, are considered to happen simultaneously. : As for Metaion, the Timelord effect that returns all other monsters to the owner's hand, and then inflicts 300 points of damage to the opponent for each monster returned, are these two actions considered to happen simultaneously? If you use "Metaion, the Timelord" effect to return a "Zoma the Spirit", since it does return to the hand, it is counted towards the number of returned cards. However, if you use "Metaion, the Timelord" effect to return a "Fluff Token", since the "Fluff Token" stops existing when it leaves the field, it never returns to the hand, so it's not counted towards the number of returned cards. : If you use "Metaion, the Timelord" effect to return a "Zoma the Spirit" being treated as a monster, or a Token Monster like a "Fluff Token" to the hand, are these counted towards "the number of returned cards" while inflicting damage? If a Synchro Monster or Fusion Monster on the field would be returned to the hand, they return to the Extra Deck. Furthermore, if a Synchro Monster or Fusion Monster is returned to the Extra Deck, it will be counted towards the number of returned cards. : If you use "Metaion, the Timelord" effect to return a Synchro Monster or a Fusion Monster to the hand, are these counted towards "the number of returned cards" while inflicting damage? Even if "Degenerate Circuit" is face-up on the field, the effect of "Metaion, the Timelord" will still activate, but due to "Degenerate Circuit", the cards will be banished instead. Therefore, you do not include those cards while counting the number of returned cards. : As for "Metaion, the Timelord" effect that returns all other monsters to the owner's hand, and then inflicts 300 points of damage to the opponent for each monster returned, is this effect still activated if "Degenerate Circuit" is face-up on the field? Also, if it does activate, and the monsters returned to the hand are banished instead, are these banished monsters counted towards "the number of returned cards" while inflicting damage? When a face-up Defense Position "Metaion, the Timelord" is switched to face-up Attack Position during the Damage Step by the effect of "Final Attack Orders", the Battle Damage you take becomes 0. Also, if "Enemy Controller" is activated during the Battle Step so that "Metaion, the Timelord" is in face-up Defense Position during Damage Calculation, you can't reduce the Battle Damage inflicted by "Airknight Parshath". : When a face-down Defense Position "Metaion, the Timelord" is attacked by an opponent's monster, and when it's flipped face-up, during the Damage Step of that attack, it is switched to Attack Position by the effect of "Final Attack Orders", is the Battle Damage you take still reduced to 0? 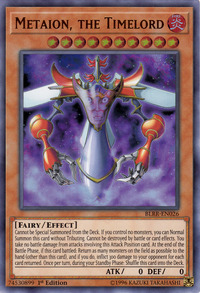 Also, if a face-up Attack Position "Metaion, the Timelord" is targeted for an attack by the opponent's "Airknight Parshath", and during the Battle Step "Enemy Controller" or similar card is activated to switch "Metaion, the Timelord" to Defense Position, can the Battle Damage inflicted by "Airknight Parshath" be reduced to 0? If there's a "Plaguespreader Zombie" on the field that was Summoned by its own effect, since it's not possible to return it to the hand because it is banished instead, it is not counted towards the number of returned cards. : At the time of resolving "Metaion, the Timelord" effect, there's a "Plaguespreader Zombie" on the field that was Summoned by its own effect that won't be returned to the hand, and will instead be banished when it leaves the field. In that case, is that "Plaguespreader Zombie" counted towards "the number of returned cards"? At the end of the Battle Phase, when the effect of "Metaion, the Timelord" activates, if "Divine Wrath" or "Light and Darkness Dragon" negate the activation of that effect, "Metaion, the Timelord" will not activate that effect again during the same Battle Phase. : At the end of the Battle Phase, when the effect of "Metaion, the Timelord" activates, if "Divine Wrath" or "Light and Darkness Dragon" negate the activation of that effect, will "Metaion, the Timelord" effect activate again during that same Battle Phase?